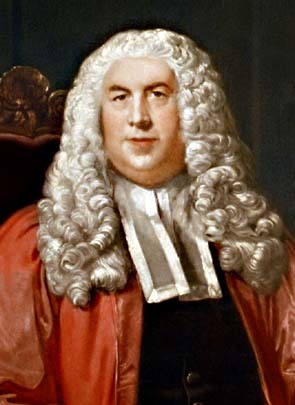 William Blackstone's parents died when he was young but that never stopped this great English lawyer from sharing the great gift of legal knowledge, then selfishly-held by legal professionals [see also the painting of Blackstone at William Blackstone (1723-1780)]. He became a lawyer (i.e. "called to the bar") in 1746. In 1761, he married Sarah Clitherow and in1768, he was elected to the British Parliament and in 1770, was appointed judge. Starting in 1753, he began to give lectures on the "Laws of England" at the University of Oxford and had the foresight to retain his manuscripts, improving and enlarging the content annually. His lectures were a great success - students and others flocked to them - and in 1756, he published book 1 of his Commentaries on the Law of England, continuing until the publication of Book 4 in 1759. For the first time, the common law was rendered readable and understandable by non-lawyers. The Commentaries did for the law what Martin Luther had done to religion 250 years earlier when the cleric translated the Bible from Latin to the language of the people. Overnight, the law was accessible to ordinary citizens. Others, such as Thomas Wood in 1720 or even Sir Edward Coke in 1628 and 1640, had tried but their books sold poorly. "No sooner was the work completed, but many of its positions were vehemently attacked by zealots." "Law, in its most general and comprehensive sense, signifies a rule of action.... which is prescribed by some superior and which the inferior is bound to obey." His Commentaries on the Law of England became an important foundation of American law and even in England, the publication far exceeded the man himself. Indeed, Blackstone fancied himself a legal academic and in spite of his fame among the people, chased his doctorate, professorship, and then a seat on the bench. He even became a member of the English Parliament but later declined an invitation to become England's Solicitor-General. It was shortly thereafter that he acceded to the bench. Stodgy legal academics jealously denounced his work but to no avail. For decades, a study of his four volume Commentaries was required reading for all first year law students. The first few pages of his 1756 Book One are available here. "He it was who first gave to the law the air of a science. He found it a skeleton and clothed it with life, colour and complexion. He embraced the cold statue and by his touch, it grew into youth, health and beauty." "... taught jurisprudence to speak the language of the scholar and the gentleman; put a polish upon that rugged science, cleansed her from the dust and cobwebs of the office and, if he has not enriched her with that precision which is drawn only from the sterling treasury of the sciences, has decked her out to advantage from the toilet of classical erudition, enlivened her with metaphors and allusions and sent her abroad in some measure to instruct." That was an understatement. The Commentaries were shipped to America and Canada, and subsequent British colonies such as Australia and New Zealand, where it shaped the law of those states. To the general populace, he was a real hero. While legal purists chastised his simplistic version of the common law, English people embraced his plain language, plain truth version of the hithertofore esoteric law of the land. "The husband... by the old law, might give his wife moderate correction for as he is to answer for her misbehaviour, the law thought it reasonable to intrust him with the power of restraining her by domestic chastisement, in the same moderation that a man is allowed to correct his ... children.... The lower ranks of people, who were always fond of the old common law, still claim and exert their ancient privilege, and the courts of law still permit a husband to restrain a wife of her liberty in case of gross misbehaviour." He spent the last twenty years of his life at his residence at Wallingford, just south of Oxford, in a building known as Castle Priory House. Brightwell, C. L., Memorials of the Early Lives and Doings of Great Lawyers, 2002.